Get ready to relive the ’80s and early ’90s when SEGA was at the height of their video game prowess with SEGA Genesis Classics. Over 50 of SEGA’s most iconic games all in one package. Once revered in their heyday, do they still hold up today or do they rely too much on Nostagia? With almost every game developer releasing their own retro collections on the Nintendo Switch like Bandai Namco Museum Pac and SNK 40th Anniversary Collection, SEGA has decided to jump on the bandwagon as well with their very own game collection. SEGA Genesis Classics brings the retro goodness of 16-bit graphics with classic titles like Alex Kidd, Sonic the Hedgehog, Phantasy Star and many, many more. SEGA was a video game giant back in the day to rival the likes of Nintendo and Atari, before PlayStation and Xbox came onto the scene and became the powerhouses they are today. Though SEGA stopped creating hardware back in 2001 after the underrated Dreamcast fell short amongst the gaming community, they continued to create games for both Sony and Nintendo and also aided in the development and publishing games like Bayonetta and Mario & Sonic At The Olympic Games. All the games in SEGA Genesis Classics are displayed in their original 16-bit graphics. The main menu however, is portrayed in HD in the form of someone’s bedroom which is a very nice touch. The many different game settings can be accessed on this screen and are shown as various appliances around the room. The TV plays games, you can select any of the 50 games on the game rack and watch a short animation of the game being inserted into the Sega Genesis console underneath the CRT TV monitor. The radio contains the audio settings and you can see challenges and achievements via the trophy (Extras) on the desk. The video settings can be altered as well. You can choose to play in standard 4:3 or stretch the screen. You can even play with the in-game TV monitor in view to further replicate the experience of sitting up close to the TV in the good ol’ days. The old chiptune music and sound effects are meticulously replicated so every game feels as authentic as possible. You can alter audio levels like music and sound effects via the music player in the bedroom. Normally, this is the part where I would talk about gameplay but with over 50 games to choose from, I am sure you would want to finish reading this review before you are eligible to collect your pension. Instead, I will cover the many genres that are available to play. 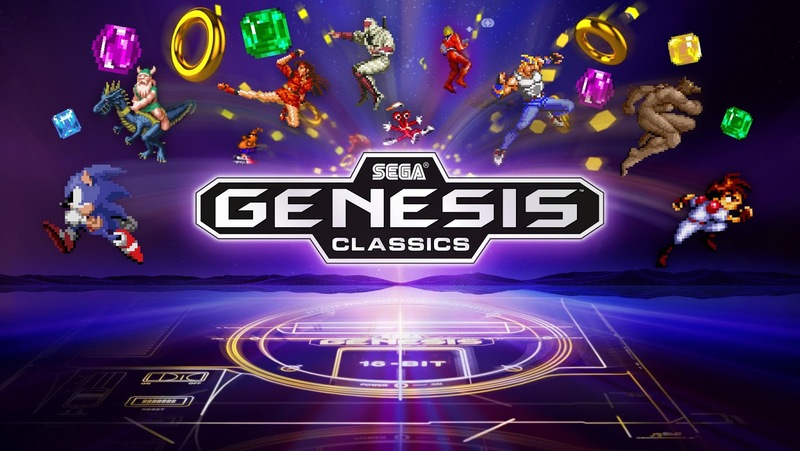 SEGA Genesis Classics has arcade games, puzzle games, RPGs and Platformers, in the form of Sonic The Hedgehog 1 & 2, Columns, Streets of Rage, Golden Axe and many others. There is a little of everything for anyone looking to scratch their retro itch. Some of the games support same screen co-op play like the Streets of Rage games, and you can even play the games online as well. You can randomly join a game or alter your own matchmaking sessions to narrow down which games you want to play with someone online. A handy feature that has made its way into modern emulators is the option to save you game whenever you like. Just like in the NES Classic Edition console, SEGA Genesis Classics offers 4 save slots to save and load from for each game. To go one better though, you can even rewind your game if you mess up and retry that difficult stretch in the game without losing a life. This has fast become my favourite feature as controls can be a bit tricky at times and some of these games were not exactly noob friendly. Another feature is mirror mode. This gives you the option to play every single game in a mirrored fashion with all texts, textures and sprites now facing the opposite way. It can be a little confusing to begin with but try not to focus on the text too much and you should get the hang of it in no time. SEGA Genesis Classics supports a multitude of controller options from Pro controller to a single Joy-Con. The default control layout is easy to use but for those that are not happy with the control layout can alter it in the Input menu aka the controllers lying on the bedroom floor. It must be said that the extent the developers went to making each game play as authentic as possible extends into the controls as well. They can be sluggish and multiple inputs like simultaneous button pressing is not very much liked in some of the games. As with many games in the 80’s and early 90’s, moving your character around and getting them to jump and punch at the same time took finesse and knowing which buttons to press and in which order. Back in the day, it would cause many of us to rage quit and throw the controller with such force that it makes us wonder how they still worked after such abuse. Fortunately, the rewind feature helps ease the pain by giving you infinite possibilities to rectify your mistakes. That said, a bit more responsiveness between the controls and the character movements on screen would have been nice. There is no real need to have emulated, sluggish controls in this day and age. An option to make them more responsive would have been appreciated, being so that almost everything else has an option. Even though having 50 classic SEGA titles in one collection sounds pretty awesome on paper, the truth is not so glamourous. Not all of the games have aged well and some are a serious strain on the eyesight. Sonic 3D Blast is one such example and I would not recommend playing it for long periods of time. It is hard to maintain focus on the screen as Sonic speeds all over the place and doesn’t seem to slow pace to make for easier tracking. Not all the games included are real winners either. There are some titles that were not very popular the first time around and seem to have been included just to help fill out the collection. Their inclusion doesn’t bother me too much as I just won’t play them much or will focus playing the other games that I prefer to play more. SEGA Genesis Classics does its best to bring back some of its most iconic games and some not so iconic ones as well. It offers gamers that grew up playing these games a chance to take a trip down memory lane and dig up all those fond memories they used to have when playing on the SEGA Genesis or Mega Drive. The price is very affordable as well. At around $26, it works out at about 50 cents per game which is a bargain and perhaps more appetizing than forking out $80 for a SEGA Mega Drive Mini which supposedly launches next year. If you were a SEGA fan growing up, then this would make a nice stocking filler for the holiday season. Even if you aren’t much of a SEGA fan but want to experience what video games used to be like before the likes of Easy difficulty modes and hand-holding tutorials, SEGA Genesis Classics is an affordable collection that further builds on the ever-expanding library of the Nintendo Switch.